Hollywood Studios has undergone massive changes since 2015. Many machines have been retired, and many more moved to new locations. As of March 2019, no machines have been placed in the new Toy Story Land. An 8-die machine was added in July 2017, replacing a 3-die machine. 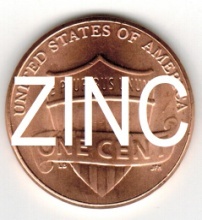 This machine supplies its own zinc pennies. Because of this, copper cents are not available. 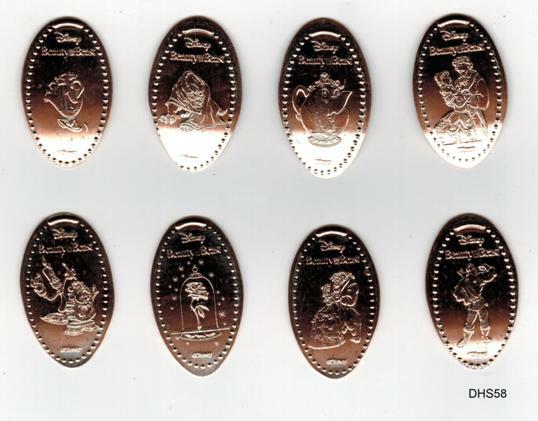 The three designs are Roger Rabbit in Benny the Cab; Lady & the Tramp; and Baloo the bear from Jungle Book [Presscoins # MGM0069, MGM0079-0080]. 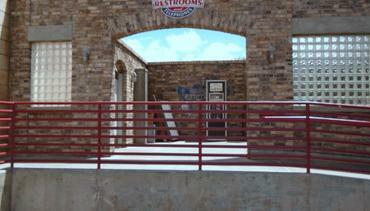 The machine was located in the short walkway between the Celebrity 5 & 10 store and the camera store. When the camera shop closed in 2016 for refurbishment, this machine disappeared. When the camera shop reopened in 2017, the machine was gone. It was later replaced by an 8-die zinc machine (set # DHS56). The single-die machine was replaced in September 2014 with a three-die machine featuring designs that had been removed from other machines earlier. Set of 4 designs from the Sorcerer's Hat Shop at Disney's Hollywood Studios. These designs were introduced in 2011. 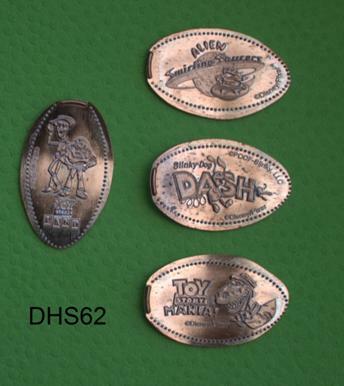 Designs: Phineas; Ferb; Carl from Up; Russell and Dug from Up [Presscoins # DHS0066-0069]. When the Sorcerer’s Hat souvenir shop was removed, this machine disappeared for half a year – but it returned in July 2015 at Hollywood Junction, the information kiosk at the corner of Hollywood Blvd. and Sunset Blvd. This new machine was placed in 2015 behind the Prop Shop outside the Mike & Sulley meet-and-greet. In 2016 it was moved to the Hollywood Junction information kiosk when the Prop Shop area closed. 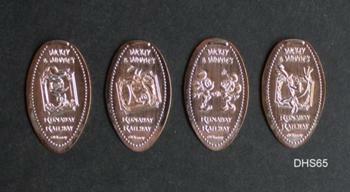 Designs: Sulley, Mike, Boo, Randall [Presscoins # DHS0128-0131]. This machine was retired in January 2015 when the hat was removed from in front of the Chinese Theatre. 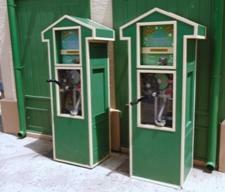 The penny machine was thought to be retired, but appeared later and is still available (Set DHS10, above). 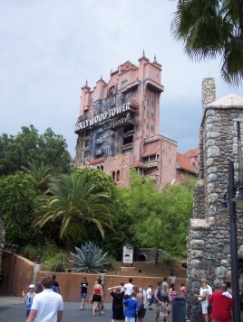 Designs: Tower of Terror; Mickey Mouse with camera; film strip series – artist Mickey. Artist Mickey and Tower of Terror are retired. Mickey Mouse with a camera was off-stage for a while, but is not found at PizzeRizzo. The Mickey’s of Hollywood machines were moved to other locations (Pizza Planet and Prop Shop). When those areas were closed for park expansion, the machine was retired. An 8-die machine was added in July 2017, replacing a 3-die machine that had 3 princes. This machine was removed in 2017, replaced by a machine with 8 dies that dispenses its own zinc pennies. Two designs were retired, but the Lumiere & Cogsworth design popped up in a new machined at the Holiday Inn on Hotel Plaza Boulevard (see our Resort Hotels page for that set). An 8-die machine was added in July 2017, replacing a 3-die machine that featured other Beauty & The Beast designs. An 8-die machine was added in August 2017. Designs: Tower Hotel logo; Goofy singing (Rock n Roller Coaster); bellhop Stitch. The logo design was retired in 2019 when a dated quarter was added to this machine. This machine was added in late 2015. The Star Tours machine was retired in May 2016 and replaced by this machine at Legends of Hollywood. It has three all-new designs: Kylo Ren, R2-D2, and Yoda. There are two machines – one inside (3 dies, DHS25) and one outside (4 dies, DHS26). They are available separately here. 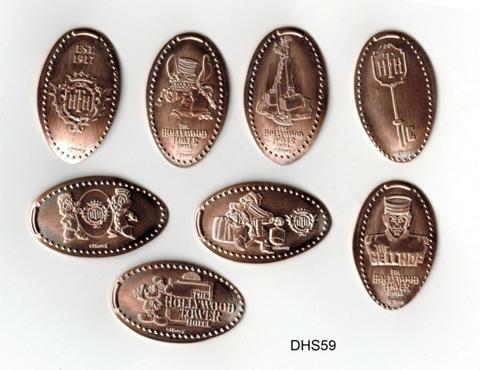 Outside (set DHS26): 4 designs [Presscoins # DHS0038-0041]. 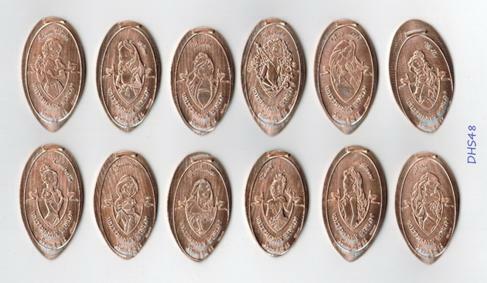 This set was retired in February 2019 and replaced with four new dies – although two of the designs appear identical to the ones featured here. 4 Pixar "Cars" designs originally located at the Luigi’s Garage character greeting area. This machine was removed in late 2015 as the area was being refurbished; it later reappeared on Sunset Blvd. at the courtyard outside the Rock ‘n’ Roller Coaster. Designs: Mater & McQueen; Lightning McQueen; Mater with Radiator Springs logo; and Mater alone. All three designs are from Frozen. Anna, Elsa and Anna together, and Olaf. This machine was retired in 2016, replaced first by the Star Tours machine and eventually by a new Star Wars machine (DHS51). The coin with Anna & Elsa came back and is now at PizzeRizzo. 4 classic Disney figures from the Lights Motors Action stunt show at Hollywood Studios. 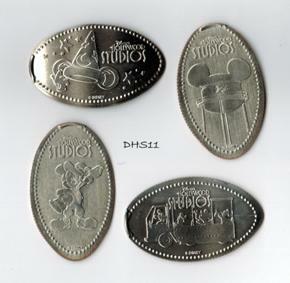 Designs: race car driver Mickey; Minnie with checkered flag; Mickey on motorcycle; and Goofy on motorcycle [DHS0034-0037]. This attraction has been closed, but the machine has been moved to various locations within the park. It is now found at Sunset Center on Sunset Boulevard at the restroom entrance. Another 8-die machine was placed with the Star Wars theme – this time at the Launch Bay in Hollywood Studios. 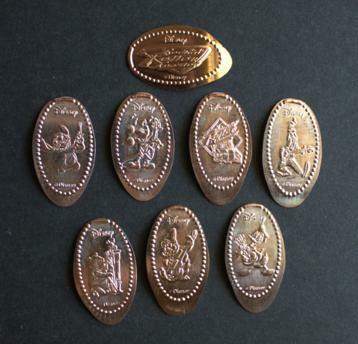 Eight fresh designs, pressed on zinc pennies supplied by the machine. Copper coins are not available. This machine was added in November 2016. A machine with 3 designs from the Big Hero 6 movie was added in November 2014. Designs are Baymax 2.0, Hiro, and Fred. This set was retired in 2015 when the Animation Building was closed. It returned on-stage at Pizza Planet, and then was retired again when Pizza Planet was renovated in 2016. It was brought back in 2017, added to the meet and greet area at Epcot. 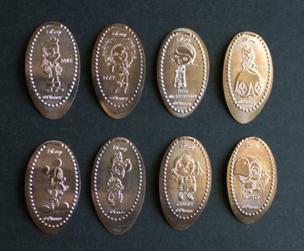 Unlike my normal coins, these 12 coins are pressed on shiny ZINC coins. The machine supplies the pennies. 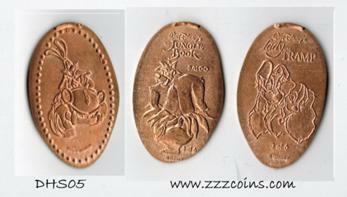 At first, it supplied circulated coins. By October 2015 it was dispensing new shiny pennies. This is the second set from the revised dies. 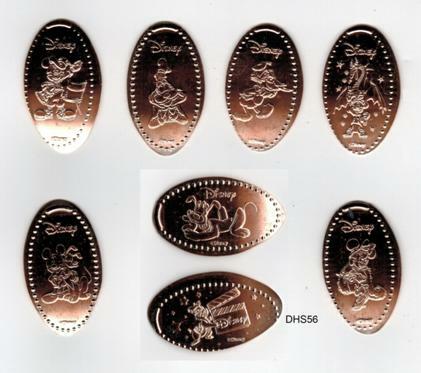 Presscoins.com designates these as numbers DHS0116a to DHS0127a (the first set did not have the “a”). I do not – and will not – have the retired first set. This machine was moved in June or July 2018 to the Disney Corner store in Disney Springs, but returned to the In Character shop in October 2018. Elsa joins fellow princesses Ariel and Cinderella. This set was retired in 2015, making way for the 12-die “Heroines” set. The “Frozen” coin later reappeared at a new machine at the airport in October 2015. 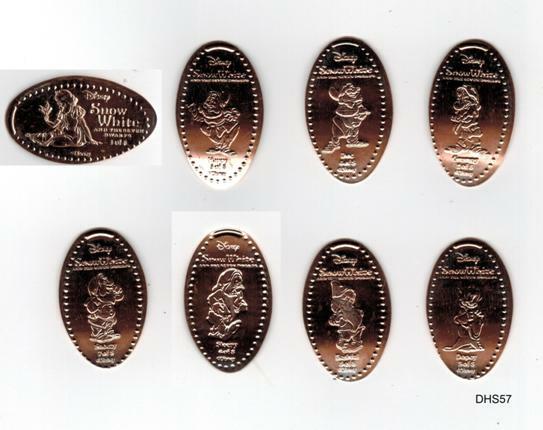 Snow White was replaced in 2014 to make way for a coin from “Frozen.” She returned a couple months after, at Oscar’s (where a 3-die machine has replaced the single-die machine). This machine was retired when the new 12-die Princesses machine was installed in 2015. 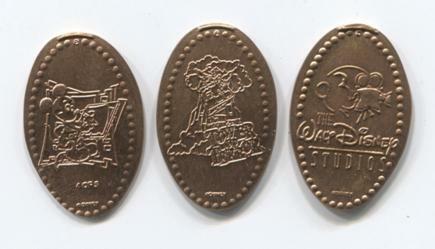 4 Toy Story coins from the Toy Story Department machine across the walkway from Toy Story Mania. The machine was retired in February 2019. Eight new designs were released in July 2016 and placed at the outdoor gift shop in the Echo Lake area. 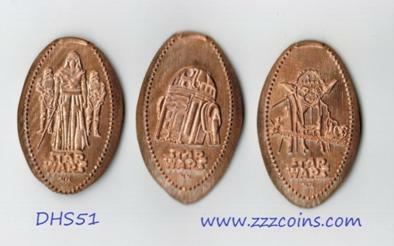 Unlike my regular pennies, these are pressed on shiny zinc cents supplied by the machine. Set of 4 designs from the exit area of the Indiana Jones Epic Stunt Spectacular show at Disney's Hollywood Studios. There is one machine at the Indy show area; this is the complete set. Designs: Indiana Jones Epic Stunt Spectacular show logo; Chip as Indiana Jones; Mickey as Indiana Jones with whip; Silvermist (fairy). Set of 4 designs originally found at the L.A. Cinema Storage. There was one machine at the store; this is the complete set. In 2014 this machine was moved to Prop Shop as L.A. Cinema Storage was being re-themed into a Starbucks coffee shop. When Prop Shop was closed for park expansion, the machine was moved to the Indiana Jones area. Designs: Mickey Mouse with Megaphone; Goofy with film reels; Minnie Mouse singing; Rosetta (fairy) [DHS0042-0045]. This machine replaced the Tron machine at the Prop Shop. When Prop Shop was closed in 2016, this machine was moved to the Indiana Jones area. Two new machines were added in July 2017. 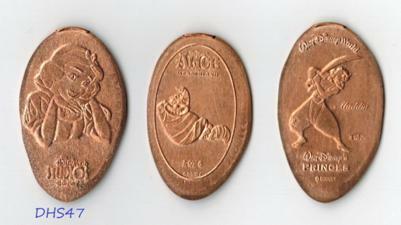 There are a total of 3 new coins and 3 recycled designs. 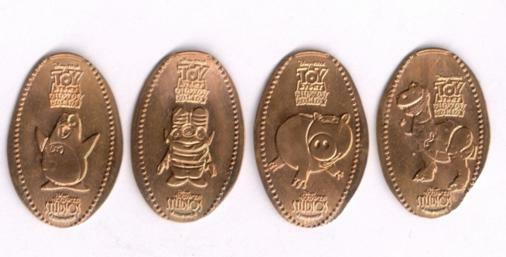 Complete set of 4 pressed pennies originally located at the Honey I Shrunk the Kids playscape at Disney's Hollywood Studios. When the playground area was closed for park expansion, this machine was moved to the Stage 1 Company Store (Muppets). Designs: Tinker Bell; Iridessa; Flik; Heimlich [DHS0046-0049]. The 3-die quarter machine was returned to the Muppets’ store at Hollywood Studios (Stage 1 Company Store) in November 2018. It now features RES0285 (Mickey with Camera), which is new to this machine; DHS0094 (Minnie in front of stars); and DHS0061 (Belle). This set does not include any dated ‘year’ designs.